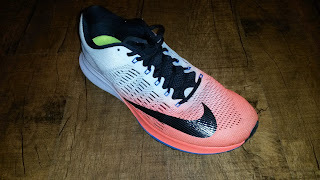 The Nike Zoom Elite 9 has the best forefoot cushioning I have yet to experienced. The forefoot is soft yet packs some rebound when the pace picks up. 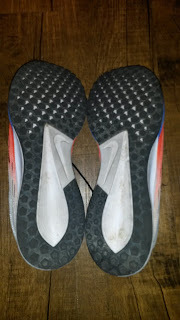 The midsole is far softer than the previous version. 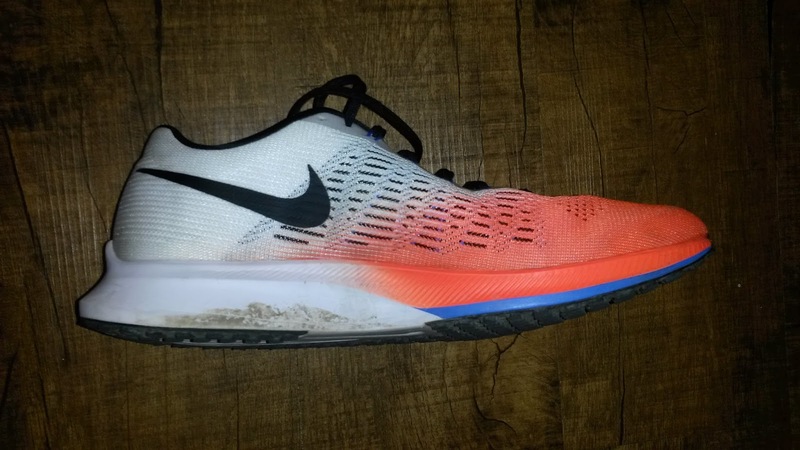 It is not in a mushy way, just not quite as firm as Zoom Elite 8. 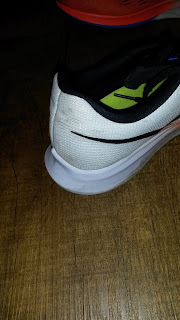 This is particularly noticeable in the heel, which no longer feels like your heel is hitting stiff cardboard. The Zoom Elite 9 comes with a full length Cushlon midsole that feels fairly consistent. Even with the soft and responsive Zoom Air unit, the midsole transitions nicely where ever you land. I would normally get mad at the slight posterior protrusion of the heel (one of my pet peeves), but it is so minor and combined with the softer sole and curved heel, it did not bother me. 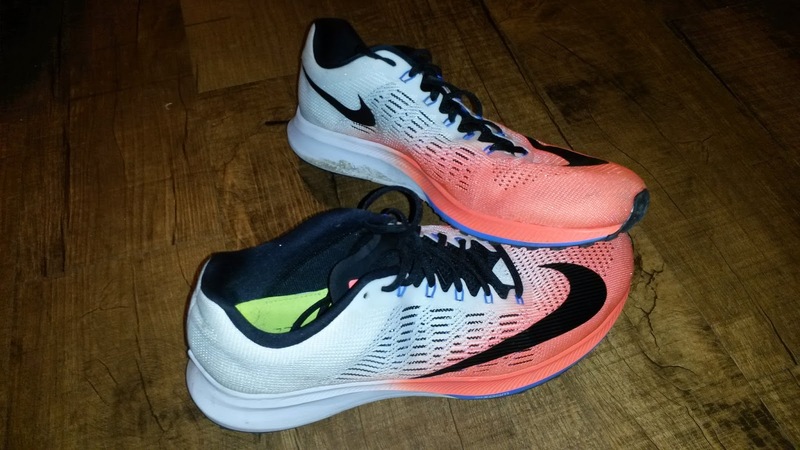 For those who have run in the Streak 6, the Zoom Elite 9 will feel very familiar. These two shoes are built on the same awesome last, however the Zoom Elite 9 has a good deal more cushioning and the zoom unit lies in the forefoot, not the heel as in the Streak 6. The wider forefoot is carried over that compensates for the narrowish midfoot. This is a fairly neutral shoe, although it does have a higher arch that disappears quickly after being broken in. 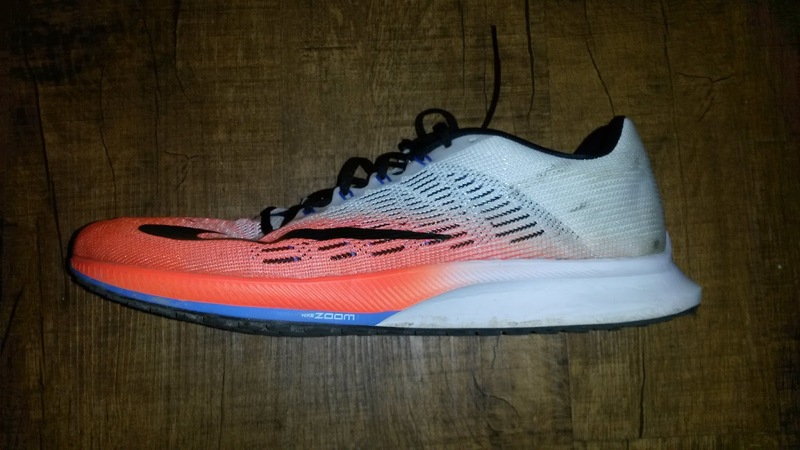 The Zoom Elite 9 comes in at 8.2 oz (per runningwarehouse.com) with an 8mm drop. This shoe will rival many other lightweight trainers and sturdier racing flats (Adios, Asteria, NB 1400v4). Many individuals will be able to use this as a lightweight trainer or workout shoe. Others will find this shoe works very well for long distance races up to and beyond the marathon if you find the streak 6 too minimal. For me, the Zoom Elite 9 has become my full time daily trainer and leaves me very comfortable after long runs, workouts and easy runs. I personally would not race in this shoe but it holds up very well for everything else (I prefer the Streak 6 for racing and faster workouts). 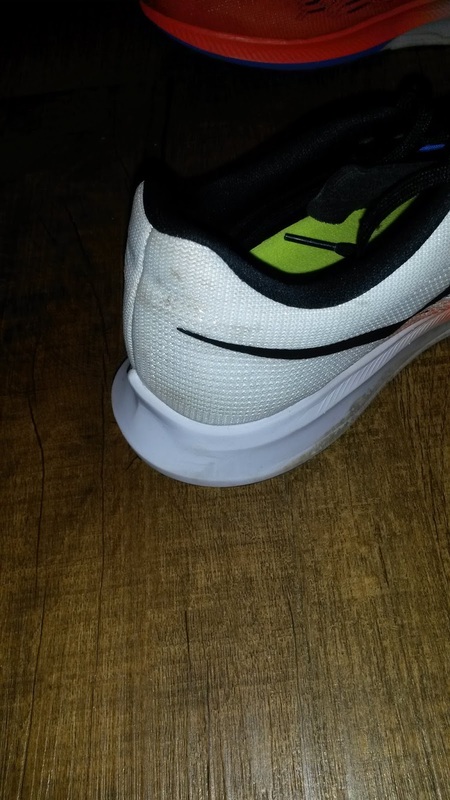 Like the Streak 6, the Zoom Elite 9 has a fairly square/rounded toebox. Initially this feels fairly snug due to the upper riding low, but opens up after break in to a comfortable but not sloppy fit. The heel is fairly snug with only a minor and low heel counter. If you have a sensitive achilles/calcaneus (pump bump) this would be a great shoe for you. The heel and fit is locked in enough that I did not have to lace lock my pair, which is the first time I haven't had to do that on a non racing shoe. The thickness of the upper is increased compared to the Streak 6. The forefoot does not have the holes in the mesh. The upper feels fairly consistent and soft against the foot throughout. I have run sockless several times in this shoe and have had minimal issues. I am amazed at the combination of the fit and the softness of the upper. It is so rounded for a Nike shoe (clearly that's changing) and I have not once felt like my toes were being pressed. At the same time, I have not had ANY slippage issues with this shoe, even around tight corners. Overall a very well done upper and shoe. The durability on both the upper and sole have been great for such a light shoe. After almost 100 miles I am seeing next to no wear on either despite some trail use in Chino hills. This is a great example of a shoe with a more square-ish toebox that does not feel sloppy. 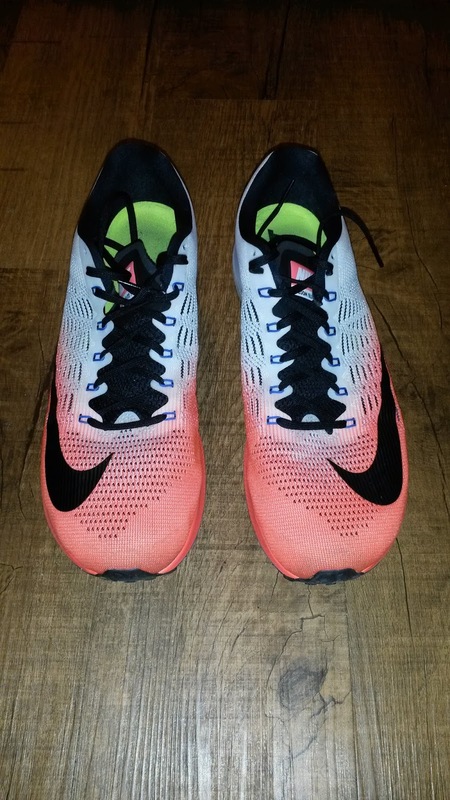 Nike has done this very well with the Streak 6, Streak LT, the majority of their new spikes and now the Zoom Elite 9. As a DPT, narrow fitting shoes do not bother me. People have feet that are different widths. The fast taper in the forefoot bothers me. This does not come from a minimalist inspired way of thinking and I do understand that in some cases people will want the snuggest fit they can find for racing (many elite runners I have treated prefer this in their spikes). The issue with the fast taper of the toebox, particularly on the medial side of the toes, is that it can lead to chronic imbalances between muscles and can contribute to many of the hallux valgus toes and bunions I see out there. By having a overly quick taper, the big toe is pushed laterally. This may not seem like a big deal, but you have muscles that move the great toe in the transverse plane that can become imbalanced.. The abductor hallucis is the muscle that pulls the big toe medially and the adductor hallucis pulls the great toe laterally. Having an overly tapered forefoot can lead to shortening of the adductor hallucis and lengthening and weakening of the abductor hallucis. Some individuals are already at risk for this given our previous discussions on how tight calves can cause overuse of the subtalar joint, causing them to evert and roll over the inside of the first toe (which is what causes medial aspect of the 1st metatarsal bone to grow out in response to the excess forces... and then a bunion forms!!). The fact that you have muscles at this junction means that you should focus on trying to stretch the adductor hallucis and strengthen the abductor hallucis, especially if you want to maintain healthy foot posture! The abductor hallucis originates at the posterior aspect of the arch. The way the muscle and tendon runs means that it helps shorten the arch in addition to pulling the big toe medially. This muscle is particularly important in working with the fibularis longus, posterior tibialis, anterior tibialis and the foot instrinsics in supporting the medial longitudinal arch. The point I'm trying to make with all this is that having this muscle stretched out not only places you at risk for a bunion, but for collapsed arches. This may further increase your injury risk from other muscles trying to compensate for weakness of the abductor hallucis. Most people are so weak in this area that attempting to move their great toe medially immediately causes cramping in the arch. That's your abductor hallucis, that is so weak that it freaks out upon use. Make sure you stretch the opposing muscle first (adductor hallucis) as you do not want to strength a muscle in an overly lengthened range if you are trying to balance out opposing muscles. So you want your big toe to be as straight as possible for healthy foot posture and that means have a shoe that maintains that! Which for Nike to do in so many of their shoes recently is awesome. Look for a full post on muscles affecting the great toe in the coming months. Nike honestly nailed this shoe. My only comments would be to get ride of the posterior extension of the heel. Does that really affect the ride? No as the midsole compresses well. I just found it a bit annoying initially... but that's mostly because I'm a DPT and biomechanics nerd. Nike did a fantastic job with this shoe. 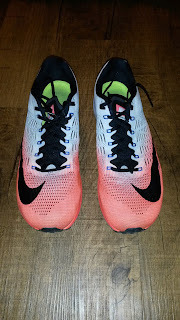 It is light, cushioned, handles pace changes and speed very well, has an anatomic but snug forefoot and seems to be very durable for a ligthweight trainer. This is definitely a rival to shoes like the Adidas Boston, Skechers Razor and Saucony Kinvara in the lightweight category. All the issues from the previous version have been patched up into a very versatile shoe. If you have a chance, definitely try this shoe. In approximately 100 miles it has become one of my favorites. 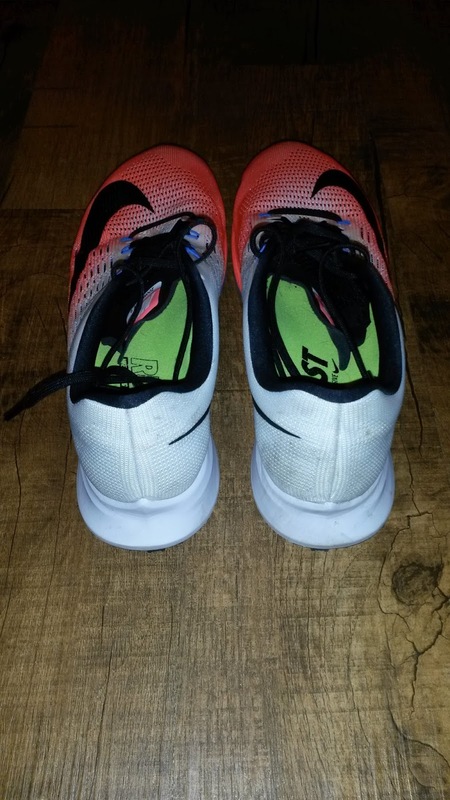 These shoes were provided free of charge for winning the 2016 Bryan Clay 5k from A Snail's Pace Monrovia. I put at least 75 miles on trainers and 25 miles on racing flats. Currently I have 94 miles on my first pair and they are still going strong. As always, my views are my own. My blog should not and does not serve as a replacement for seeking medical care. If you are currently injured or concerned about an injury, please see your local running physical therapist.